A hookless shower curtain is a convenient and popular system for bathtubs and showers. If you have been considering upgrading your bathroom and have become tired of dealing with unsightly broken hooks with your current curtain, or are looking for a more modern, streamlined look, then you may want to consider looking into the many varieties of hook-free shower curtains available. One of the great things about a hookless shower curtain system is the fact that the curtain rod doesn't have it be taken down to install it. Traditional shower curtains with rods and hooks are inconvenient and time-consuming to replace. Quite often, regular hooks will start tearing into the vinyl or fabric material, causing damage and expense. With a hook-free curtain, it's simply a matter of installing it one time and you're finished. No hook shower systems allow users to snap the system over an existing curtain rod quite easily. This means no more installing hooks or worrying about wear and tear. Many people install fabric curtains on the outside for a more decorative look along with a liner, though some systems come with a single shower curtain that is fast drying. You'll find that hookless curtains are simple to work with and look tasteful. They slide back and forth easily and rarely rip when moved. With traditional hooks, your choices are limited to plastic or metal. Plastic can crack and break and tends to fade. Metal has a tendency to rust and looks unattractive. If you have anyone in the family that is rough with shower curtains, you should certainly consider a modern hook-free curtain, as they are far more durable and dependable. In a commercial situation, where shower curtains need to be maintained on a daily basis, and frequently washed and replaced, switching to no hook shower curtains will save time for the maintenance and cleaning staff, and therefore money for the operation. There are many sources for ringless shower curtains; however by shopping online you'll probably get far more variety and pricing options. If you are buying online, make sure you are aware of any shipping or handling charges that may significantly impact the price per shower curtain. built tough and can match almost any interior. You'll find a nice range of lengths, styles and colors. Keep in mind that if you have a taller than normal shower area, you might require an extra long hookless shower curtain. This extra length can help you to keep bathroom water cleanup to a minimum. Taking care of your ringless shower curtains couldn't be any easier. All you need to do is take it down and throw it in the wash. Then, simply put it back in place. No need to worry about using the dryer or hanging it on a line to dry. Another benefit of a hook-free fabric curtain system is the fact they look so attractive. It's no wonder that so many people are switching over to hookless shower curtains, considering the advantages. There are many reasons why a waterproof mattress pad is a good investment. Mattresses can get wet in many ways—from a dog or a child having an accident, to a spill from coffee, tea, or even plain water. If the mattress gets heavily soaked, it will be impossible to get it completely dry. A wet mattress is a breeding ground for mold and mildew. Sleeping on an affected mattress can lead to asthma, swollen eyes, a chronic cough, skin rashes and eruptions, headaches, sore throats, and chronic post-nasal drip. If the problem is not attended to, the mold can spread to other parts of the house. Bathrooms are especially prone to mildew problems, which can be manifested as visible mold growth on windowsills (especially wooden ones), blinds, curtains, and caulking around tubs and sinks. Since mold and mildew like warm, wet areas, the kitchen is also at risk. The dishwasher may become contaminated, and the drain in the kitchen sink may start to smell. Soft foods that are generally safe to leave out, like breads, cookies, muffins, and doughnuts, will suddenly show green or black spots, indicating that the air in the home is severely compromised. Mildew can also form on and under carpets. This silent green or black threat to health may not be noticed for some time, and even the characteristic mildew smell may not be recognized for what it is. Many people would simply say the room is only stale, and that it needs to be vacuumed more often, or that it needs an air freshener. Neither of these actions would get to the heart of the problem. Mildew has also been found growing on shoes, purses, coats, suitcases, clothing, and other items stored in dark, enclosed places like closets and attics. Mildew will take advantage of any weak spots in the house’s structure. This includes compromised basement walls and windows, leaking pipes in walls or under sinks, and any area where moisture accumulates. If the problem is serious enough, mildew will grow in the walls, where it is impossible to see it. A situation like this can lead to serious health issues for the inhabitants of the house, and even to the condemnation of the house itself. No one should have to sacrifice a good night’s sleep for quality mattress waterproofing. Many waterproofing mattress pads today are made of vinyl or plastic layers, which can be noisy. For those who are concerned about spills on their beds, and yet don’t want to have the disturbance of crackling plastic beneath them, the Quiet Comfort Waterproof Mattress Pad is the solution. The waterproofing feature is a double-laminated Teflon backing that is both effective and quiet. The Quiet Comfort Waterproof Mattress Pad is made of polyester and cotton with four ounces of poly fill for a soft touch. This mattress pad is designed to be easy to install, and the snugly fitted elastic skirt will accommodate a 16-inch mattress. The Wholesale Quiet Comfort Mattress Pad comes in Twin, Full, Queen, and King sizes. Massage must be an invigorating and relaxing experience. No one is relaxed when laying on irritating sheets or liners that resembles butcher's paper. When setting up for a massage session the key words to remember for massage table linens are hygiene, comfort and longevity. Plain white cotton is a fail safe regarding hygiene as it can be bleached repeatedly for crisp whiteness and sanitation. It also reduces time spent sorting your linens by color and material. The downside is any staining from oils, lotions or clients themselves is going to be easily visible. Testing to see which oils can leave stubborn stains is a very good idea. White for some is not a comforting color but it is still a good choice for cleanliness. If white isn’t your choice, try true colors in colorfast dyes. Colors like blue or sage green are generally relaxing. 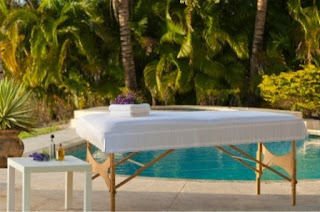 What is more important is the texture of the massage table linens. Cotton and cotton blend are still favorites as they can accommodate various weaves and thicknesses. Cotton terrycloth is popular for it's absorbency and thickness. Many are familiar with terrycloth bath towels. Because it can be rough on the skin when dry, it is not recommended for the top sheet of the massage table. Cotton flannel is one of the softest materials but also very thin. It can be used for top sheets but will need to be replaced one or two times a year due to wear. Muslin comes in thin nainsook weave and thick organdy. It is traditionally used in linens for its resistance to wear despite its extreme thinness. It is inexpensive so can be replaced as often as needed. Maybe the best option is a newer product on the market, Soft Touch Luxury Microfiber flat sheets. They feel like a 400 thread count cotton sheet, due to their brushed surface and the high quality ultra fine yarn (1/20th the diameter of a strand of silk), but at a fraction of the cost. They launder extremely well and with the use of a dryer sheet, they dry 30% faster than cotton or cotton blend sheets, which saves you time and money. These ultra breathable sheets come sized for a massage or spa table, measuring 66” wide x 96” long. As for the actual use of your massage table linens, once you have chosen the right material, color and texture, its time to choose the right sizes. Fitted sheets are needed for the first sheet. The top sheet, which will come into contact with your client, should be a flat sheet preferably with no labels or decorations. I have seen sheets with the massage center's name embroidered for example. Use fitted covers for the face cradle. What Makes the Ecosmart Pillow Eco-friendly? Businesses and individuals who want to exercise green living can now do so with Ecosmart bedding products. Ecosmart polyester fiber is a recycled product that has been processed into an extremely high quality fiberfill from a renewable source. When used in Ecosmart pillows, the microfiber’s supreme resiliency offers its users the ultimate in support. The fiber is both antimicrobial and hypoallergenic. This new pillow is the best candidate to replace all previous pillows including down pillows, foam pillows and other types of fiberfill pillows. While it offers a similar feel and resiliency to down pillows, it can, unlike down, be washed up to 50 times without losing its loft or shape. It also conforms to the head and offers more precise support, just like memory foam, without the extra cost. For people who dislike having their pillows retain heat, Ecosmart is a good replacement choice. This pillow does not absorb body heat and remains cool throughout the night. Also, users will awaken after a good night's rest without tension in their neck and shoulders. The Ecosmart pillow reduces the strain on these common pressure points. Normally, individuals buy down pillows because they feel down offers the utmost in comfort. With this new bed pillow technology, they can get the same first class luxury from an Ecosmart pillow. These pillows are available in standard, queen and king sizes. This earth-friendly alternative for pillow filling is made from recycled PET plastic bottles. That's right from a resource you discard daily, in abundance. These bottles would normally have been sent to a landfill and be buried under the weight of other trash, never to biodegrade. Instead of ending up in a landfill, each time one Ecosmart pillow is made, 14 plastic bottles are recycled and spun into a very fine high quality fiberfill. The act of recycling plastic bottles reduces our carbon footprint and makes our world a cleaner place. Ecosmart pillows take one more step in the right direction. These pillows are also treated with ClearFresh; a non-toxic USDA accepted chemical compound that permanently protects against the growth of a wide array of bacteria and microbes. One of the desired properties is a pillow with the best protection against microbes, for which Ecosmart offers a reliable resistance. Another property often sought is allergy resistance. The advent of this new technology eliminates allergy sensitivities normally associated with other fillers. Allergy sufferers will not suffer allergy symptoms from Ecosmart pillows. Help save the environment with one more way to reduce your carbon footprint; buy an Ecosmart pillow, because it makes absolute sense. It's made of a product we urgently need to recycle now that the beverage industry has exploded with a demand for bottled water and other drinks. It’s comfortable, offering good support and it’s resilient holding its loft and shape after repeated washings. It maintains a cool temperature during sleep and it's hypoallergenic. With all these positive properties, the Ecosmart pillow is the ideal pillow, perfect for every home, and with its ability to be washed repeatedly, an excellent choice for hotels, spas and other businesses that use pillows on a day-in, day-out basis. Hotels go through a number of pillowcases on a weekly, even daily, basis. These pillowcases disappear due to any number of different reasons, ranging from elimination due to wear or stains, to guests taking them for any number of reasons. Because of that problem they require the ability to purchase bulk pillowcases, and to do so in a size that makes sense for their business. Suffice it to say that these packs can get rather large, even if they are not required for most purposes. Part of the housekeeping department’s job is to go through the room and to determine if anything requires replacement. Although this sounds easy enough when it comes to shampoos and the mini-bar, this also pertains to any item in the room. The furniture may be allowed to become a little scuffed up, but the linens must be pristine, especially in an era when the number of germaphobes is a healthy percentage of the population. This means that every single piece of linen and towels will be removed and replaced; in the laundry room they are inspected and if they show too much wear they are discarded. Although a pillowcase may be kept around in order to serve as a rag, it must be replaced in the hotel’s linen closet. There are other reasons for the missing pillowcases. For guests looking for an easy way to take things out, the pillowcase is a convenient bag. It can be easily knotted and tossed in with other dirty clothes. For guests, this means that they can grab any small items in the hotel room, throw them inside a pillowcase, tie it off, and then throw it in a suitcase, taking all of the small items in the room such as the shampoo and soaps when they vacate the room. As the pillowcase is now missing, it needs to be replaced as a matter of course, and most hotels do not charge the guest for the pillowcase. There are a number of other issues that mandate replacing pillowcases, such as stained cases, usually from people eating in bed; they relax, eat dinner or dessert in bed, use a pillow for support, and whatever they are eating subsequently spills on the pillow and stains the case. There are any number of reasons for needing a replacement pillowcase, and hotels have seen all of them, usually within the first three months of business; suffice it to say that we are bringing up some of the more politely discussed reasons for replacement. Because of all of these reasons and more, hotels tend to purchase bulk pillowcases. It is standard operating procedure to just replace the cases and not worry about it, unless there is a good reason to worry about it, such as too many cases from the same room or organization. Bulk pillowcases are one of the saving graces of the wholesale business for hotels given the large number of them that they go through on even a weekly basis. It may seem trivial, but this is a very important item to most customers, because no one wants to rest their head on a stained, damaged or worn pillowcase. It is a far better practice to replace them on a regular basis than to have a customer complaint for something so easily avoided. If you own a hotel or restaurant owner, or specialize in providing catering services, owning the right tablecloths is a necessity. Round tables ought to be well covered, not just to protect the table top, but to also make them more beautiful and welcoming to those dining. If you have round tables, then shopping for wholesale round tablecloths is ultimately the solution towards creating that “wow” effect to your customers or clients. However, a couple of things have to be looked into when shopping or buying tablecloths. The size of the tablecloth is usually influenced by the size of the table. Since not all tables are of the same size, you should ensure that you get the right size before making a wholesale purchase, especially if you are buying from far away. The standard sizes of tablecloths are 72, 90, 120 and the 132 inches in diameter. Assuming that you would want the tablecloth to have at least an 8 inch drop off the edge of the table, the largest tables that would fit these standard sizes of tablecloths would be, respectively, 56, 74, 104 and 116 inches in diameter. As a precautionary action, it’s always wise to take the measurements of your tables before making a purchase of any form. If more than an 8 inch drop is desired, take into consideration that the standard height of a dining table is 30 inches. Although cotton is the most common fabric for use on commercial tablecloths, the inclusion of polyester into the fabric blend will provide a smoother, more wrinkle-free product. Cotton and polyester are commonly used in dining room areas, whereas vinyl is more suitable for outdoor venues. Silk tablecloths are usually used only for luxurious events and venues. Similarly, different people and occasions call for different colors of tablecloths. One solution to dressing up white table cloths to go with a particular color scheme is to purchase smaller, square toppers, runners or place mats whose colors would coordinate with a particular event; for example, at a wedding, to match the colors worn by the bridal party, or in school colors for a banquet or prom. Colored napkins can also be used for a similar effect. Wherever you purchase your wholesale round tablecloths,be sure to check on what after-sale services they offer. If you shop online, shipping charges can impact the price, how long shipping and processing will take, whether they accept returns and if they offer refunds. Purchasing bedding can be expensive when an establishment has many beds, which need to be made up and changed on a regular basis. Purchasing bedding items made of quality materials can be an economical and practical choice. Linens made with high quality materials will often cost more to purchase than those made with cheaper fabrics, but they are designed to last longer, which eliminates the need to frequently replace worn bedding. One way to save money on the cost of bedding is to purchase high quality wholesale bed linen. The higher quality wholesale sheets are made with microfiber, which makes them long lasting as well as extremely comfortable. The luxury microfiber sheets can last longer than the more expensive sheets made with cotton. The threads are designed to withstand breakage and can be made thinner than ordinary cotton thread to give the sheets a soft luxurious feel. These sheets use a measurement system that rates their quality the same way cotton sheets are rated by thread count. The 125 GSM rating is for the softest sheets available. The process used to create these soft, comfortable sheets also includes brushing the threads on the finished product to give them the luxurious feel people like to sleep on. When looking to purchase wholesale bed linen, selection can be an important point. Some establishments such as resorts and hotels need to have their linens meet certain specifications. The products available through wholesale merchants can be purchased as both flat and fitted sheet sets. The various sizes available can also be used to fit specially designed pillow top bed mattresses with larger dimensions than standard mattresses. The white percale sheets are commonly used in hospitals and other health care facilities where many of the beds use the larger size mattresses. The technology used to make the percale sheets prevents them from wrinkling and also allows them to stand up to frequent laundering without shrinking or shredding. For those individuals who are concerned about the impact processing plants have on the environment, there are environmentally friendly linens available at wholesale prices. These products are made by using recyclable plastic bottles. The plastic can be turned into durable fibers to create linens that are both durable and economical. One Eco-friendly pillow can significantly reduce the number of plastic bottles thrown into a landfill. Ten plastic bottles can equal one pound of synthetically produced fiber. Recycled plastic bottles are used to make comfortable pillows as well as the casing placed over them. In addition to the various sheets, pillows and pillowcases available at wholesale prices, there are other bedding products sold as wholesale items as well. These products can include comforters, duvet covers, mattress pads and blankets. Products purchased through wholesale dealers cost less because they are sold in large quantities. The lower price does not mean the quality is inferior. The luxury microfiber sheets can be sold at a price of less than ten dollars for a twin when purchased in bulk lots containing 24 pieces. Showers, spills, drips, accidents, etc? Towels are used for a variety of things around the home or business. They are used in the bedroom, kitchen, bathroom, garage and other areas. Towels come in all shapes and sizes, and are part of ones daily routine. Towels are not only made of cotton, but of cotton-polyester blends and other fabrics as well, the latest trend being microfiber. Towels also are made in different prints, shapes and styles. Depending on the size of the towel that you need, especially if your preferred color of towel is white, you may find it less expensive to buy wholesale towels. Who uses wholesale towels? Businesses such as restaurants, hotels, hair dressers and cruises use plenty of towels on a given day. An individual may buy just one or two towels, but as a business it is more economic for them to purchase in large quantities to gain a cost savings. There are more than just bath towels; the normal set per person being a bath towel, a hand towel and a washcloth. Some people also use towels for household cleaning, and polishing automobiles. There are also dishtowels and paper towels. What are towels made of? Towels are made of terry cloth, usually cotton or cotton-polyester blends and sometimes with other decorative materials. One easy way to judge the quality of towels made of cotton is their weight. The heavier the towel, the better the quality. That might not be the case with the newer microfiber towels, because that is a very lightweight material. Towels are also dyed specific colors to a persons liking, but in a commercial setting white towels are standard, and for good reason. When laundered correctly, good quality cotton or cotton blend towels will continue to look bright, sanitary and appealing for many washings. Where can a person purchase towels? Towels can be purchased almost anywhere. Department stores, grocery stores, dollar stores, online websites, magazines and several other places all sell towels. As with any item, you get what you pay for. So for example, if you buy a towel from a dollar store, expect to get dollar store value. However, if you purchase from a high-end department store, you will pay more and may or may not get the value that you want. These stores purchase towels in a bulk amount so they may provide them to their customer at a less expensive price than if they bought them one by one. Why should a person buy wholesale towels? They are generally sold to the customer at a less expensive price than buying individually. Even if purchasing online, many companies offer free shipping and a bigger discount for quantity. If you were buying towels for a commercial entity, such as a hospital, hotel, spa or health club, you would definitely buy your towels wholesale. Like any other commodity, the quality of the towels would tend be commensurate with their price, but when dealing with an unfamiliar vendor, this may not always be the case. It also pays to find out if the cost of shipping and handling is included in the price of the towel, and what their minimum order consists of. So, as with any purchase, it would probably be best to deal with a vendor you are familiar with, and whose reputation as a supplier is a trusted one. In all bedding ensembles, quilted mattress pads are the most important first layer of bedding. They are necessary for comfort and protection. No amount of luxury, or cost of other bedding can offset the misery of the lack of a mattress pad. Mattress pads also protect and extend the life of all mattresses. Any mattress, regardless of its age or quality must have some covering to act as a barrier and air cushion. Mattress pads are available in a wide range of prices and qualities. There are different styles and purposes that accomplish certain objectives. All mattress pads provide some protection for the mattress and provide comfort for the sleeper. All pads have some type and volume of filling. There will be a covering of cloth and an attached skirt that is stretchy. The stretchy skirt allows even the largest pads to have a snug fit. It is important that the top of the pad is quilted to ensure that the filling doesn’t shift from body weight or laundering. The basic quilted mattress pads have adequate filling to provide a barrier of protection and to allow air flow for comfort. The basic pad will keep sheets properly positioned and protect the mattress. Quilted mattress pads are easily to install and extremely washable. This style comes in a range of prices usually relative to the volume of filling. This straightforward style is very affordable. The pillow topper mattress pads have very luxurious amounts of filling and will make a firm mattress feel soft and cushioned. Due to the additional filling, there is even more air flow to regulate body temperature. The pillow topper mattress pad is great for light sleepers and will even solve insomnia for some. This variety has very deep pockets of stretchy skirts that are also structured with elastic threads allowing the higher volume of filling to still be easy to manage. Pillow topper mattress pads are very washable and durable. An older mattress will feel newer with a pillow top. A budget mattress will be more luxurious with the pillow top. Waterproof mattress pads are the solution for mattresses that are at risk for spills and fluids. This style of mattress pad can be constructed with basic amounts of filling or may be the more luxurious pillow top style with puffier and denser filling. The waterproof mattress pads will deliver exceptional comfort and discreet protection at the same time. Waterproofing is best when provided by a Teflon coating, unlike vinyl or plastic, which can be noisy and inhibit airflow. The Teflon coated layer is underneath the fill and the poly/cotton cover so airflow and comfort to the sleeper is not compromised. Well-made waterproof mattress pads are extremely washable and will endure repeated washings. There are numerous benefits for buying microfiber sheets instead of cotton, poly-cotton blend or silk sheets. Microfiber plush sheets are durable and very soft and can cost less than cotton poly-cotton or silk sheets. Microfiber may cost a little more than low quality cotton sheets but are still far more affordable than Egyptian cotton sheets. These sheets come in king, queen, full, and twin sizes and are more wrinkle resistant than nearly any other type of sheets. The king and queen fitted sheets have a 14” drop while the twin and full sheets have a 12” drop. If like most commercial users, you dry these sheets in a dryer, with the use of fabric softener sheets, they will come out of the dryer almost completely wrinkle-free and the use of fabric softener sheets will also help eliminate static cling. Microfiber sheets dry fast; in fact, they can dry up to 30% faster than cotton or cotton blend sheets. Anyone can relate to the extra care one has to take when washing and drying traditional cotton sheets, where wrinkles can be a genuine problem. Microfiber sheets can be washed over and over without shrinking. Who doesn't want to save money on bills with microfiber sheets - not only do they take less time to dry, but with their lighter weight, they cut down on wear and tear to your washers and dryers. These lightweight, breathable sheets are a plus if allergies are an issue because they are made of a synthetically manufactured fiber. In fact, microfiber sheets are one of the best ways to avoid allergies, because dust mites cannot become embedded inside the sheets' tightly woven fibers, as they are able to in much less closely woven cotton or poly-cotton blend sheets. Microfiber sheets are not graded by thread count; they are graded by gram weight. The greater the gram weight, the more plush the sheets will feel. A good weight to look for in a plusher type of microfiber sheet is 125 GSM. If they are then finished with a brushing process, they become even softer and more breathable. That is why the sheets we are referring to in this article are called microfiber plush sheets. If the brushing process is not used in the finishing method of the microfiber fabric, they will still have the durability and quick drying benefit of regular microfiber sheets, but will lack the smooth, luxurious touch of the plusher, brushed sheets. The threads used to weave this fabric are a hundred times finer than human hair, and this makes them feel very smooth and velvety. Microfiber sheets are nearly impossible to rip when they are used as intended, and are perfect for those people who tend to get warm during the night, because these lightweight sheets wick moisture away from the skin. Microfiber sheets are very stain resistant, because spills tend to bead up instead of soaking in. It is clear that microfiber sheets are the better choice when it comes to durability and price; microfiber sheets will save time, energy and will outlast other sheets.